This guide was written with the assumption that the reader has already read the Osiris User Guide. At least the last few sections regarding using and navigating the Osiris ROM Editor. It is also assumed that the reader is an experienced tuner with a solid understanding of internal combustion engine tuning techniques. Keep in mind that some ROM versions have parameters that other ROMs do not. To find out what ROM should be used on a given vehicle, check the ECU part number with any of the UpRev software. Then reference that number against the “ROM Support Matrix” which can be found in the UpRev directory or under Start >> All Programs >> UpRev >> ROM support matrix. The “MASTER” ROMs are the ROMs that overwrite any older versions. Use the master ROM for tuning. This table is pretty straight forward. The values in the table tell the ECU what AFR target to try to run. This table should be set to the AFR targets you WANT the ECU to run. Once the table is setup the way you want the car to run there should be no reason to adjust it again. You should be using the fuel compensation table or MAF curve to correct the injector pulse widths so that the ECU hits the targets you’re telling it to run. If you try to adjust this table to get the ECU to hit a desired AFR, but that AFR is not what you put in the target table then the ECU will trim to the targets you’re telling it to hit instead of what you’re tuning it to hit and it will likely throw bank rich/lean DTCs. Once you have the fuel compensation and MAF curve tuned so that the ECU is hitting the targets you’re telling it to hit, then adjusting the tune to run new targets is as simple as changing this table. It should hit new targets with little to no tuning once the other fuel parameters are dialed in. There are 2 types of fuel compensation tables to be aware of depending on what ROM you are working with. Fuel Compensation Main is the primary table that every ROM uses. Fuel Compensation Cold is only used on some of the newer vehicles. This table is only used when the vehicle is still in warm up stage. Once the coolant temperature gets up to 80 C, then the ECU will switch to the Main table. 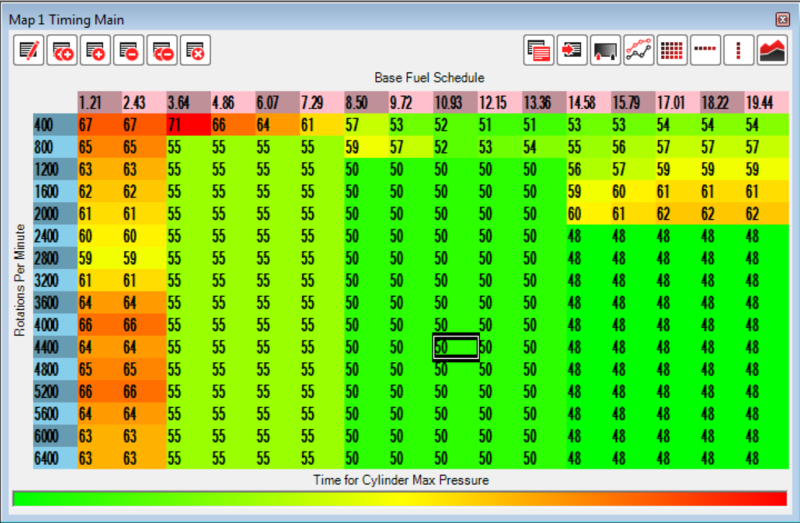 For both tables, the values represent a change to base fuel schedule (BFS) as a %. 100 is no adjustment at all. Above 100 is adding injector PW, and below 100 is taking injector PW out. This is one of the tables that you will use to correct the AFR so that the ECU hits the AFR targets that you are telling it to hit in the Fuel Target table. Tuning it is pretty straight forward. Increase the values to richen the AFR and decrease them to lean out the AFR. This is the multiplier that the ECU uses to determine the base fuel schedule (BFS). The BASIC formula is current MAF value times K value = BFS. Base fuel schedule is the theoretical pulse width that the ECU would have to run in order to maintain a 14.7 AFR. This is NOT the actual injector pulse width. The ECU will increase the injector pulse width based on the AFR target, fuel trims, other run time variable parameters, and environmental conditions. There are a couple situations where you need to adjust the K value. You will need to decrease it when running larger injectors, and increase it when running a modified MAF sensor such as a PMAS sensor, UpRev calibrated sensor or larger MAF tube. With the AFR test map loaded start doing pulls and watching the AFR. Keep adjusting the K value until the AFR starts to get as close to the target as you can get it throughout the entire RPM range. It won’t be perfect, but get is as close as possible. Increasing the K will make it richer, decreasing the K will lean it out. Once the K value is dialed in you can do the rest of the AFR tuning either with the fuel compensation table, or with the MAF table. The MAF table gives more precise adjustability, but it is not real time tunable so it takes longer to tune. Single axis = sensor voltage. Axis is static (not adjustable). Although the values in this table are raw (no real world conversion) they are directly related to grams per second of flow. Tuning the table is very straight forward. Increasing the values will increase the injector PW and decreasing them will decrease the injector PW at the given voltage. ** PMAS tuning tips: The PMAS sensors are VERY inconsistent from one sensor to the next, especially in the low voltage areas (below ~2V). To start, you will need to load the PMAS pre tuned curve with the utility named “Select MAF Type” found under the fuel section of the ROM tree. This curve will get it into the ballpark, but it will still need a lot of work, especially in the low voltage areas (idle, cranking). You MUST dial the K value in under some load so that the MAF is running over 2V. Once you have the K value set for load so that the ECU is hitting the targets that you’re telling it to hit, you will have to make adjustments to the MAF curve so that the car will idle correctly. After that you will still have to make adjustments to the rest of the MAF curve to get your AFRs perfect. ** Helpful trick: If you’ve had to raise the MAF values so high that the table is maxed out you can give yourself some more head room by raising the K value via multiplying it and then multiply the entire MAF table by the inverse of that value. For example, multiply the K value by 1.2 (120%) and then multiply the ENTIRE MAF table by .8 (80%). The end result is that the vehicle will run exactly the same, but you will have more room to raise the MAF table. The cranking enrichment is very similar to the fuel compensation table. It will modify the BFS by a % based on the table lookup. Just like the fuel compensation table above 100 is adding fuel and below 100 is taking fuel out. These tables vary from vehicle to vehicle, but they all have the same effect of setting a minimum pulse width during cranking. The actual injector pulse width during cranking does NOT match with what the ECU will log but can be verified with an oscilloscope. ** Cranking Enrichment tuning tips: One helpful tip for tuning cranking enrichment is to use the fuel compensation table. The fuel compensation table DOES still affect the injector PW during cranking. Watch the tracers for the fuel compensation table to see where it runs during cranking. It should be somewhere in the upper right hand corner. Set those cells to 100 and try to crank the engine. Try making adjustments in one direction or the other until you find the sweet spot. Once you have it cranking well, you can take the change from the fuel compensation table and use the change to multiply the cranking enrichment table and set the fuel compensation back to 100. Example: if the fuel comp had to be set to 82 for good cranking, multiply the cranking enrichment table by .82. If you can’t get it to lean out enough with the enrichment table also lower the “Cranking Minimum Pulse Width” tables. If you’ve lowered the cranking enrichment by a significant amount and nothing is changing, verify that the injector pulse width IS actually changing. There is a good chance that it may be bottoming out on the minimum injector pulse width value, or possibly even the injector latency. You may need to lower the injector minimum pulse width value, or reduce the injector latency 14V offset to bring the latency down. This table is also pretty straight forward. It will adjust the injector PW for a single cylinder across the board. Much the same as the other compensation tables, above 100 is adding fuel and below 100 takes fuel out. Injector Minimum Pulse Width is the minimum injector pulse width that the ECU will ever run during normal operating conditions. The common reasons to change this parameter are: Vehicle is backfiring on deceleration fuel cut. Idling or cranking too rich, but the K value, MAF table and fuel comp do not bring the injector PW down. This parameter is only available on a small number of ROMs, most of which are for V8 engines. It effects are really only noticeable on the V8 engine tunes. This parameter is a delay constant that is used to “smooth” the AFR lookup when the throttle is snapped open. ** Lookup delay tuning tips: Most often you will want to set this value to “0” when tuning a V8 vehicle. This becomes particularly critical when tuning for forced induction. If the value is left stock, then when the throttle is snapped open the AFR will slowly taper down to the rich setting and the engine will probably do some pinging while it’s still running the leaner targets leading to engine damage in the long run. Injector latency in Nissan ECUs is modeled by a simple line (y = mX + B) where the 14V offset is the constant B and m is the slope of the line. This utility/wizard is used to calculate the injector latency for a given 14V offset and slope and tell you what the latency will be for any given voltage. ** Injector latency tuning tips: For injectors < 750cc you can usually just run the stock latency values. The best technique is to get the injector latency values from the injector manufacturer and try to match up the 14V and 8V data points. 14V is for normal operating conditions and 8V is how low the voltage may drop during cranking. If you don’t have any latency values from the manufacturer you can adjust the slope by monitoring the A/F corrections, then load up the battery as much as possible by switching on the headlights, seat heaters, heater blower, etc… If the corrections go up, increase the slope, if the corrections drop, lower the slope. It’s not a perfect method, but it will get it close. Axis = Engine RPM. Axis is static (not adjustable). The ECU calculates the calculated load by dividing the current base fuel schedule into the value that is in this table for the given RPM. The calculated load will affect the way the AT reacts. It is particularly important that the calculated load read 100% at WOT on a forced induction AT vehicle so that the AT computer will run the correct line pressures. If you are not logging 100% at WOT, lower the values in this table at the given RPM. Nissan handles ignition timing a bit differently than what most tuners are used to working with. For max horse power with an internal combustion engine running gasoline you need the peak cylinder pressure to occur at 12-15 degrees after top dead center (ATDC). What most experienced tuners are used to seeing is a value that represents when the spark plug is fired in degrees before TDC. What is seen in the Nissan table is a representation of the TIME that it takes for the cylinder pressure to reach peak pressure after the plug is fired. The ECU uses this “burn time” to calculate when the plug should be fired in order to get the peak cylinder pressure to occur at the desired 12-15 degrees. Because this table represents time, when it is fully tuned it tends to come out pretty flat, but the ECU will still run an increasing curve with RPM. There are a few different timing tables that Nissan ECUs employ. Timing Main – This is the primary ignition table that is used under normal operation. Timing High Det – This is the ignition table that the ECU will use if it hears too much noise on the knock sensor. Timing Cold – This table is only found in the newer Nissan ECUs and it is only used until the coolant temp gets up to 80 degrees C. At that point the ECU will switch over to the “Main” table. Although there is no way to convert the table to DBTDC, adjustments are made in the same way as any typical timing table. Higher values yield more ignition advance. The only proper way to tune ignition advance is with the assistance of a dynamometer so that you can verify that the added advance is adding power and not just stress on the engine internals. When tuning any vehicle it is good practice to make sure that the ignition table is not being accessed outside of the boundaries of the table. The easiest way to do this is to use the “map tracing” feature and make sure that the crosshairs are not moving outside of the table during a WOT run. If the crosshair does go outside of the table, then the RPM and/or BFS axis should be adjusted so that this does not happen. On the newer vehicles equipped with VVEL, the ignition advance algorithms rely heavily on knock sensor feedback. In many cases it is not possible to make the ECU run more advance because as soon as you increase the values it hears something on the knock sensor and adjusts accordingly. For VVEL vehicles you WILL still have to pull timing for forced induction applications so that it won’t ping before it has a chance to do any learning. However for NA applications about all you can do is pull back the high spots and smooth the table out. The ECU will do the rest on it’s own. In our testing we found that pulling LARGE values from the main ignition table caused a LARGE power drop on the first run, but after a few consecutive runs the ECU would advance the ignition right back to where it was before based on knock sensor feedback. For forced induction applications it is good practice to set the entire “High Det” table to very low values (like 45), on vehicles that support the high det table. This way, if the ECU does switch into high det mode, the ignition will fall flat on it’s face and you will know there is something wrong without having to check the high det flag in the logger. You will want to put the table back to reasonable value when you are done tuning, but make sure that all the values are LOWER than the values in the “Main” table so that if it does switch over it will run less advance. If you are listening to the knock sensor for knock, then you should hear the pings well before the ECU switches over. “knock strength” which is basically a knock counter. Every time the ECU detects a knock event, the counter will jump. The amount of the jump will depend on what ROM is being run and how severe the knock was. Since the counter moves by different amounts for different ROMs it is impossible to say what a good or bad number is. What you want to look for are multiple jumps in the counter one after another. The knock counter is bound to move around a little, even on a stock car with stock tune, but if you’re seeing jump after jump through a WOT run, then the advance is surely too aggressive. For forced induction it is HIGHLY recommended that a knock listening device be used. Although there are knock parameters that can be logged we do not recommend relying on these parameters. There are times when you will hear pinging on a set of headphones or with a knock amp before the ECU picks anything up. There is a PDF at www.UpRev.com under the support section about how to build your own low cost set of knock headphones that utilize the stock knock sensor(s). ** These tables are only available to pro tuners. The X and Y axis are shared with the ignition tables. The knock window tells the ECU where to run an aggressive knock control algorithm. 1 turns on the aggressive algorithm on and 0 turns it off. Even when the ECU is running in an area where the knock window is off the ECU will still listen to the knock sensor and do some timing control, but it’s much less aggressive compared to when it’s running in an area where the window is set to 1. This is the primary table that is used to raise the flow target. The values in this table control how fast the ECU’s flow target tries to raise up to meet a theoretical flow value calculated by the ECU. This flow target is what is going to tell the ECU if it needs to run more or less boost pressure to meet the flow target. X – Axis = Boost Pressure; Y – Axis = Flow Delta (below target yields lower values, above yields higher) The values in this table relate directly to the boost control solenoid duty cycle. This table will change the sensitivity of the X axis on the Boost Sol Table. Higher values will make the table X axis more sensitive to flow deviations and force a bigger change in boost solenoid reaction. The first thing to be aware of is that the ECU is trying to hit a theoretical “flow target” not a manifold air pressure target like most tuners are used to. By tuning the flow target you can still get flat stabile boost with the factory algorithms. Assuming you need to run more boost than the current settings, the first thing to do is to raise the entire “Target Flow Modifier” table in order to bring the flow target up. You will see in the stock table that there is a very high resolution area from 7812 to 9375 of the Y-axis. This section is the “boost start” section of the map where the ECU “catches” the boost as it ramps up and starts to run the boost control solenoid. With higher values in the table you will have to do some runs and find out new point where the boost control solenoid SHOULD be starting to activate. Take note of the Y-axis value in the log for this table at that point and rescale the Y-axis so that the “start/catch” point is right at the beginning of the high resolution part of this table. See the comparison below of a stock car w/ stock tune on the left and ~17PSI tune on the right. Notice the difference not only in table values, but also the Y axis. With the “Flow Target Modifier” setup and the Y-axis rescaled for the new start boost point you will need to start smoothing the flow target modifier table to flatten out the boost curve. There is a good chance that the boost is also going to become unstable at higher RPMs with the higher boost settings. To force the boost control solenoid to react faster to target flow deviations you will need to increase the “Flow Delta Sensitivity” table in the given area of concern. That will force the Y axis of the Solenoid table to be more sensitive and in turn cause quicker response. See the example tuned table below. Stock is on the left, tuned is on the right. Rev and Speed Limits are pretty straight forward. What you enter is what you get. Rev and Speed Limits tuning tip: One problem that people seem to have over and over again is not raising the “Throttle Cut Rev Limit” when trying to run a higher rev limit. It is best practice to set the throttle cut rev limit at least 100 RPMs BELOW the fuel cut. It’s much safer and better for the engine to use the throttle cut instead of bouncing off of the fuel cut. Cam advance is straight forward. What is entered in the table is what the ECU will attempt to run. X-Axis = Unknown theoretical value (follows accelerator, but not perfectly); Y-Axis = Engine RPM The values in this table affect how aggressive the throttle response is. UpRev we’ve actually discovered quite a bit more about how the electronic throttle control works. Expect to see more tables for throttle control very soon. Although this table is present in all ROMs, it is ONLY used for automatic transmission vehicles. The values in the table are the estimated torque that will be delivered at the given RPM and load (BFS). The ECU sends this value to the AT computer so that the AT computer can run the appropriate line pressure. This table is particularly critical for forced induction vehicles with automatic transmission. When running larger injectors the entire BFS axis gets skewed due to the reduced injector pulse widths for the same flow. The entire table should be shifted to the left so that the AT expects more torque at lower BFS. Basically you just increase the values in this table wherever the AT feels squishy. You can also verify that the transmission is not slipping by logging the “AT Slip” parameter in the ROM editor. This parameter should stabilize once the torque converter locks up. If you’re running above TC lock up and this parameter starts to waiver that is an indication that the clutches in the AT are slipping. Crank Drag A, B, and C: These tables represent the amount of drag on the crank. Increasing the values in this table will make it harder for the ECU to trip the misfire DTCs. If you set all the tables to the maximum value the ECU will never trip the misfire DTCs. Axis = Engine coolant temperature. Axis is static (not adjustable). Idle targets are very straight forward. The ECU will try to idle at the set RPM for the given coolant temp. Export & Import All Tune Data: These utilities are used to copy all the tune data from one ROM to another. Export all tune data will save all of the tune data from the ROM file where the utility was activated. This includes all the table values + axis and all other operational values. Import all tune data will copy everything that was exported into the new ROM where it was activated. ** Export & Import All Tune Data tuning tip: These utilities currently do NOT copy the DTC settings, so if you’re copying a tune that requires some DTCs to be disabled, you will need to manually disable those DTCs in the new ROM. 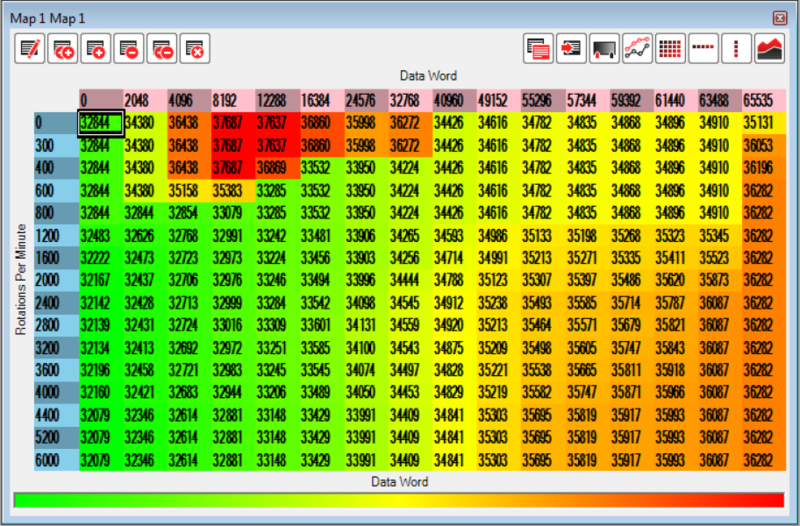 Load & Save RTT Files: These utilizes are used to copy the RTT data from one map to another. 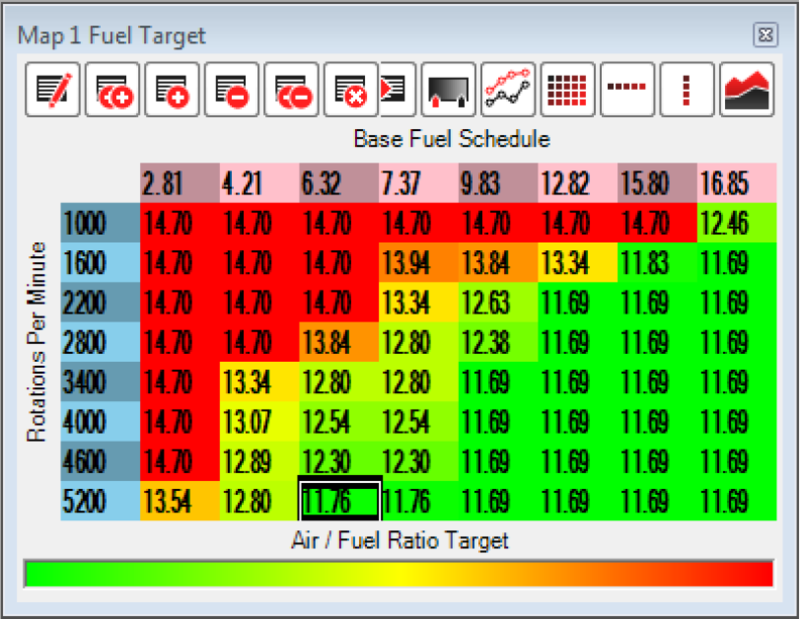 The data saved in the RTT file is ONLY the data that is real time tunable (such as ignition tables, fuel tables, K value, and rev/speed limits). Any static parameters such as axis will NOT be saved/copied. ETC on/off: This setting disables the torque management aspects of the electronic throttle control. Turning this setting off will have the effect of making the throttle linier. The ECU will try to run the throttle plate % at whatever the accelerator % is. ** ETC on/off tuning tips: Turning this setting off will also disable the cruise control. Most of the feedback about disabling this setting is that the throttle is far too touchy, even for race drivers. Chances are you will never turn it off, but it is there if you’d like to try. ** This setting is only available to pro tuners. NATS stands for Nissan Anti Theft System. Turning this setting off will completely bypass the NATS code inside of the ECU. You will be able to start the engine without having a key that has been married to the vehicle. The setting is intended for testing purposes and for race cars where you may need to swap out ECUs regularly. – Target Air/Fuel Ratio: The AFR that the ECU is attempting to run. Should coincide with the AFR table lookup + lookup delay. – AFR (only available on vehicles that are equipped with a WB O2 sensor from the factory): The AFR is calculated based on the A/F Sensor voltage which is referenced to a table in the software. It is NOT returned directly from the ECU. The reading SHOULD be close, but checking against another WB O2 sensor is never a bad idea. – Knock Strength (only available on earlier, pre 2009, vehicles): The value will jump up every time there is a knock event. The amount of jump will depend on the ROM that is being run and the severity of the knock event. – High Det Flag (only available on earlier, pre 2009, vehicles): This parameter will switch from 0 to 1 when the ECU has detected too many knock events in a given amount of time. When it changes to 1 the ECU will run the high det timing table. – Injector Duty Cycle: The injector duty cycle is calculated directly from the engine speed and injector pulse width. The ECU CAN report injector pulse widths that give a duty cycle greater than 100% even though that just means the injectors are wide open. at WOT after TC lockup, then the clutches inside the transmission are slipping. Nissan Standard parameters: **There are MANY more standard Nissan parameters that will not be described here. Most are self explanatory. 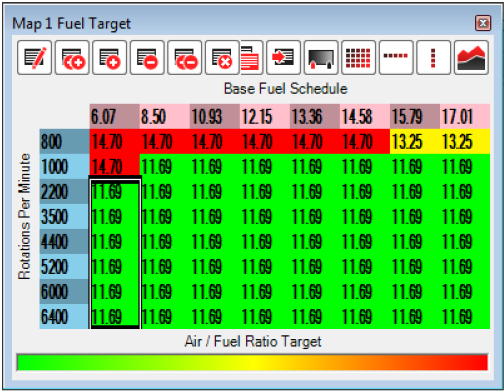 – A/F correction (B1/B2) = Actual real time fuel trims. Above 100% is adding fuel, below 100% is taking fuel out. – Base Fuel Schedule (BFS) = The theoretical injector pulse width that the ECU would have to run in order to maintain a 14.7 AFR. This is NOT the actual pulse width which will be different depending on the target AFR and fuel trims. It is assumed that if you’re running forced induction you’re also running a modified MAF sensor. If you are running LARGE injectors (>750cc) you will probably also need to setup the injector latencies based off of the data provided by the manufacturer. For most injectors < 750cc the stock latencies will be close enough with no need to adjust. If you are running injectors > 600cc, you will probably need to reduce the Minimum Injector Pulse Width value. You can start by simply cutting it in half. Setup the Ignition Main table with some low/safe numbers so that the engine does not ping when testing the AFR and tuning ing the K Fuel Multiplier. If the ECU utilizes the High Det table, also set that entire table to ~45 so if the ECU does switch over during testing it will be safe and also obvious that something went wrong. If the engine is built for higher RPMs, rescale the RPM axis of the fuel and ignition tables accordingly. Flash the starting map onto the ECU. Activate real time tuning for map 1 and start logging and tracing in the ROM editor. With the K Fuel Multiplier and AFR target table open start the engine. It’s probably not going to idle very well, especially if a PMAS MAF sensor is installed. Keep the engine running by giving it some gas if it wants to die. Do a dyno run while verifying that the AFR target tracer is moving into the safe/flat AFR targets that you have set. ** Since the factory wide band AFR sensors were never intended for forced induction, the range on most of them only goes down to ~11.5 and at those readings they are not the most accurate, they are only in the ball park. It is recommended that the AFR tuning be done with the dyno’s AFR sensor. Check the AFR from the run and adjust the K Fuel Multiplier as needed to get the AFR as close to the set target as possible throughout the entire RPM range. It may go lean or rich in the higher RPMs. If it does, get the AFR as close to the target throughout as much as the RPM range as possible. Once the K value is set it should not be changed again. After tuning the K value, tune the idle area of the MAF table. Simply log the MAF V and adjust the corresponding area of the MAF curve. AFR is not hitting the target. Just log the engine RPM and MAF voltage to figure out what V the MAF is at for any given RPM during the run. Keep in mind that it does take some time for the flow to get from the sensor through the cylinders and out to the exhaust, so you usually have to make adjustments 1-3 cells earlier in the table depending on how fast the engine is revving through the pull. The MAF may peak around peak torque and the engine may start to lean out at higher RPMs. In these cases you’ll have to use the fuel compensation table to add more fuel to the upper RPMs. After the AFRs are all dialed in you can start adding ignition advance to the Main ignition table until you have optimum ignition advance. Although there is a “knock strength” parameter that can be logged in the ROM editor, it is highly advised that you use a knock headphone amplifier to listen for knocking. The knock strength is not always accurate and it may very well miss some pinging that would lead to engine damage over time.